What has Stockade been smoking lately? Technically, nothing, but a smokey sensation was certainly swirling around the brewery as they brewed their first limited release of 2018: a woodfired red lager. The concept behind the beer seems to have been driven primarily by food, specifically trying to capture the smokey essence of a woodfired pizza and create a beer that pairs with, well, woodfired pizza. To do this in liquid form they came up with a lager recipe, added some specialty malt to give it an attractive red colour then loaded it up with Beechwood smoked malt and oak smoked wheat. And what they deliver in the bottle is pretty much what’s been promised; a beer that smells like it’s been gently smouldering and tastes – taking into account its lager lineage – like a very approachable blend of bacon and bonfire. 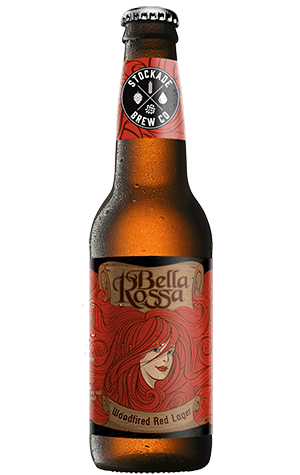 You get the impression it really is a beer that’s worth going to the effort of enjoying with a bit of food – the pizza proposition would work well, as would most things with a rich red sauce or even some classic sharp and hard Italian cheeses.